Read my review of Blackhearts here! You can count on me to be kicking, screaming, and doing everything in my power until we get confirmation from the publisher of a third book. This wonderful series begs for more in what is clearly at least a trilogy, and it truly is deserving of a proper ending. 1) As I've already mentioned, this is the pirate book I have been waiting for. There aren't enough words in the dictionary to adequately express the overall splendor and perfection that is Blacksouls. This book is about Teach and Anne's descent from upper society couple into a couple of scallywags. Since Blackhearts was a pre-pirate book, I wasn't sure what to expect in Blacksouls. I had no idea what Nicole Castroman was planning to unleash upon us, and what she did totally floored me—in the very best way possible. 2) I'm in awe of Nicole Castroman's growth as a writer. There was some action in Blackhearts, but not to this caliber. Not. Even. Close. I loved seeing this new side to Nicole's craft and I'm even more curious and excited to see what else she has up her sleeve. This story has so many layers and twists, I simply couldn't believe what she was able to accomplish in one book! 3) Teach and Anne's development is spectacular. They are so cute, and yet balanced. They are just as frustrating as they were in Blackhearts, but their love has grown, and watching these two learn more about each other while trying to survive through this tumultuous plot was incredibly moving. It gave me all the feels! Especially since every time these two are finally back in each other's arms—someone or something separates them . . . I will not rest until Teach and Anne get their wedding day. 4) I really like the new characters that were introduced in this story. Usually, I grow attached to the original characters and it's difficult for me to care at all about newcomers—which normally is what contributes to sequels with many new characters being less successful than the first books—but that wasn't the case with Blacksouls. The new faces only added to the already multifaceted and vivid story, and I actually cared about them just as much as I cared for Teach, Anne, and John! I cannot overstate how much skill this takes as a writer, especially since we all know about the dreaded Second Book Slump, right? Well—not this book, you guys. Not. This. Book. 1) As of right now, THERE IS NO BOOK 3. "I like you. If you were mine, I'd name my ship after you." "She's not yours." Teach snapped. He kissed her, his lips moving over hers, determined to remove any doubt of his affection. He lost awareness of time, of where they were, as Anne responded in kind. This is exactly what happened with Book 1. It ended on a cliffhanger, there was no confirmed Book 2. But we did get one. So, I'm hoping for the same thing here. So happy to hear that you loved this one! I haven't started this series yet but was still hoping the 2nd book was as good as the first one like everyone said. I feel like a lot of sequels haven't been holding up to the first lately. I definitely want to read this series, so I hope they do come out with a third book! So far from what I've read this year, the sequels are holding up and this one is no exception. It's so freaking good! And I hope so, too! 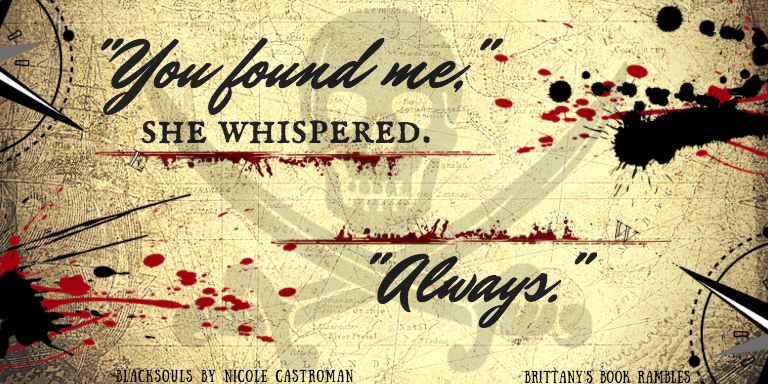 Nicole Castroman always calls Blackhearts a pre-pirate book but Blacksouls is definitely a pirate book! I'm glad you enjoyed the review and I hope you love Blacksouls/ Thanks for stopping by! This sounds pretty good! I never read book 1 but I want to. You should, Blackhearts is amazing! Lovely review Brittany :D YAY for enjoying this book so much. <3 I'm going to buy this one and book one soon, and I cannot wait to read them both. So curious :D But ahhh. Is there a love triangle? :( I hope not..
YAAAAY. I totally expected this to be "pre-pirate" as well, good to know that there are some scallywags in this one! I am PUMPED for this one and will sit vigil until book 3 is confirmed! I'M SO EXCITED I MAY JUST SIT HERE AND SCREAM. THIS IS THE BOOK I'VE BEEN WAITING FOR ALL MY LIFE FAJDKSALD. And I really liked Black Hearts so. YAS. Pirates. 😍😍😍😍 Where is a time machine tho. I need to have this in my life yesterday. I really need to read this series. It sounds sooo amazing! I love pirates! 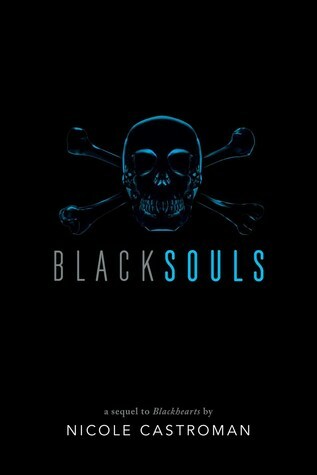 So excited for Blacksouls!! So happy to hear there is more pirates and action involved this time, and we definately NEED to encourage book 3! Oh my gosh, I absolutely LOVED Blackhearts, and there are no words for how much I need this book in my life! As much as I loved Blackhearts, though, I thought it was a bit slow and it lacked a lot of the action that I had expected...I'm super thrilled to know that there is plenty of it in this book though! WOW. I do not know this series. This must be rectified. Nods. I felt the same way about the 1st book, I read it in one night and was so angry that I have to wait until the 2nd comes out.